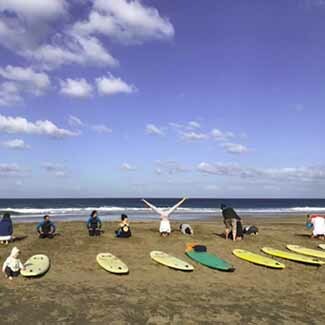 What is Surf & Yoga camp at Orange? 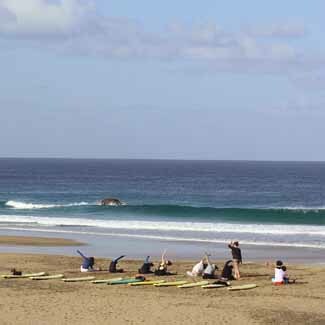 Our days begin with a quick energetic practice to wake up the body and activate the receptors to stimulate the nervous system, the lesson can be done at our studio or directly on the beach as a warm before the surf session, or to enjoy a spectacular sunset. 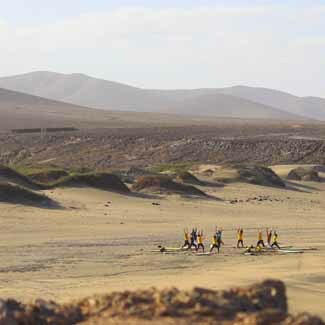 What about surf & yoga Fuerteventura? We think that yoga fits perfectly with the practice of surfing, not only for the physical benefits of stretching and strengthening the most stressed muscles during practice, but also for its power to relax at the end of the day and to increase attention when we are in water. 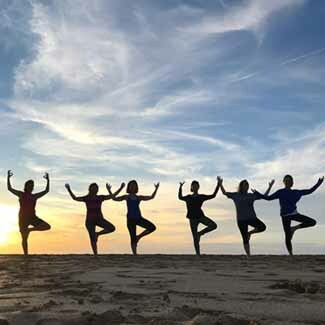 Our days begin with a quick energetic practice to wake up the body and activate the receptors to stimulate the nervous system, the lesson can be done at our studio or directly on the beach as a warm up before entering the sea, or to enjoy one spectacular sunset. At the end of the day, to relax the mind and body and stretch the muscles contracted and tired, we will practice a passive yoga, yin yoga, which helps to dissolve contractures by simply holding the position for more than 2 minutes but passively, without activating the muscles. This makes sure that we are able to stretch deeply and even reach the connective tissues, relaxing the mind and letting go. The term yoga means union and integration of body and soul. This philosophy originated from India includes mental and physical exercises that give effect to calm and balance by stimulating the complete well-being at all levels . The training of strength, stability and balance, stimulates circulation , activates the muscle , tendons and ligaments . Greatly strengthens the back muscles and helps you to have a better body posture . The combination of surfing and yoga won’t give you just a good start with your successful day of surfing and end with relaxation , but also accelerate the process of regeneration of your body, improving your ability to mobility on the surf board. 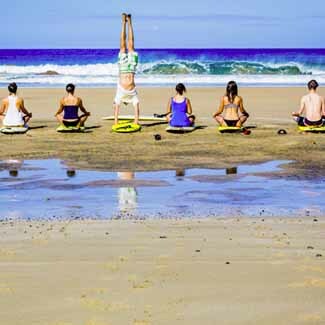 The yoga that Orange offers will be specific and designed for those who surfs , with exercises to stretch and lengthen the muscles that are used most during the sessions of surfing. If you are completely new to this discipline, or you want to go deeper into your practice, or simply want to be followed individually, this is the right option for you. An exclusive private lesson to meet your needs and deepen your knowledge. If you are also a yoga teacher or a school and you are interested in organizing a retreat / holiday combining the world of surfing, write us: Quick reply 24 hours: orangehouse7@gmail.com. Our yoga teacher and co-founder of Orange Surfschool Sara is our in-house teacher, she started practicing yoga during a trip to Australia, where she was able to fall in love with surfing, and then decided, in 2007, to move close to the ocean, on the island of Fueretventura, where together with Paolo, his companion, they found and manage Orange Surfschool. Qualified instructor for Yoga Alliance International, teaches Ashtanga vinyasa yoga (dynamic yoga), Rocket, Yoga for children and Yin yoga (passive yoga). 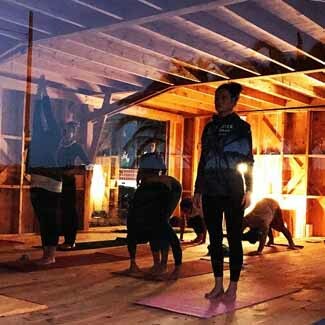 Ashtanga vinyasa yoga, derives from the Ashtanga tradition of Mysore in India, but breaks the rules of rigid tradition, breaking down the series, making the practice more fluid and accessible to everyone. All levels of practitioners are admitted to our classes, as each lesson is designed to be appreciated by everyone, making changes for each case. We move following our own breath, which remains constant and deep, with concentration and with the use of bandhas, energy centers that we activate by contracting certain parts of the body. This practice has the benefit of awakening the nervous system, bringing energy back to the body and mind, creating a young and modern approach to the vision of traditional yoga without taking away the benefits of tradition. It is a fun yoga because it creates positive energy that is savored in the first practice, and the feelings of vitality persist even after, releasing a beneficial wave of serenity and well-being. 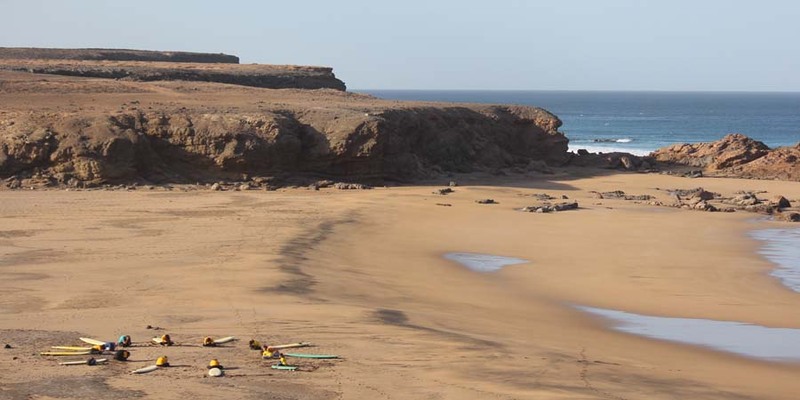 You can practice both in the morning before the surf lesson, to prepare and warm the body, or in the evening to combine sleep after a busy day. Yin yoga is a passive type of yoga practice, the positions are held for minus 2 minutes passively, trying to relax as much as possible. It's all done on the ground, sitting or lying down, flowing from one position to another slowly. The yin is not often easy, because certain positions can be uncomfortable and create tensions, because yin is also a practice of mindfulness, we try to empty the mind overcoming the will of the conscience to get out of position. But through concentration in the breath and help to deeper relaxation, one reaches one's limit in every position, with love and compassion, let us go. It is a practice that is recommended in the evening, to dissolve the accumulated tensions and some contractures and to reconcile sleep. With yin yoga we balance the daily energy that is often too much yang (opposite energy, dynamic, masculine, active). Pranayama technique is a breathing control technique that regulates energy in the body. Prana in fact means energy. Through certain breathing exercises, one learns to control the will of the breath in a conscious way, and in this way one also controls the mind and emotions. Pranayama in fact helps to overcome some emotional blocks, to overcome fears and anxieties. 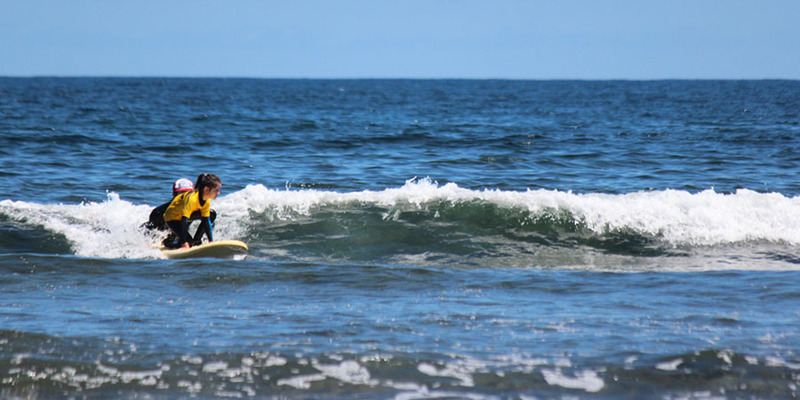 This is why it is recommended for those who surf, even at a competitive level. Meditation, on the other hand, is a state of deep concentration where one finds oneself immersed in contemplation, freeing the mind and finding ourselves in a state of peace. Yoga for children is different from yoga that is taught to adults, it is all brought to playful lievello, but at the same time they learn the basic values of yoga, such as compassion towards oneself and others, sharing, listening and listening , concentrate and relax. Lessons do not last longer than 50 minutes because the lesson takes place in a dynamic and focused manner, so as not to lose attention to the children, who need to be stimulated and listened to. In combination with the surf, it helps their muscles to relax after the lessons at the sea and to further strengthen in a complete and symmetrical way, since surfing is an asymmetric practice (more and more a part of the body is used compared to the other always there is a foot forward on the table and one behind).